Fitness Level: Most locations will involve a walk in. There are a couple of location that will be longer, from 4-8km but this will depend on the weather. the ground if often wet and slippy, good walking boots & poles are a must. • Each client will have private accommodation with the option to share a twin room and receive discount. • Breakfast, packed lunches and evening meals are included. • Personal tuition, critique sessions and post processing. • All transport during the trip, including airport transfer. The Faroe Islands are an archipelago of eighteen islands half way between Scotland and Iceland in the North Atlantic Ocean. James has created workshop for you to experience and photographing some of the most breathtaking scenery on offer with steep sided mountains that rise out of the sea to almost 1000 meters making them the tallest cliffs in Europe, small fishing villages with grass covered roofs, huge cascading waterfalls that flow strong after the smallest rainfall, deep like fjords and black sand beaches with tidal pools scattered all around. Each location we visit will offer a new adventure and we will even make the drive into the heart of the mountains of Vestmanna too the summit of Sornfelli that stands almost 2500 feet above and everything in between. You will discover not only the regular spots to photograph but locations that most photographers don't know about. The Islands are a true source of inspiration to anyone who visits. With the constant changing weather making every photograph unique. 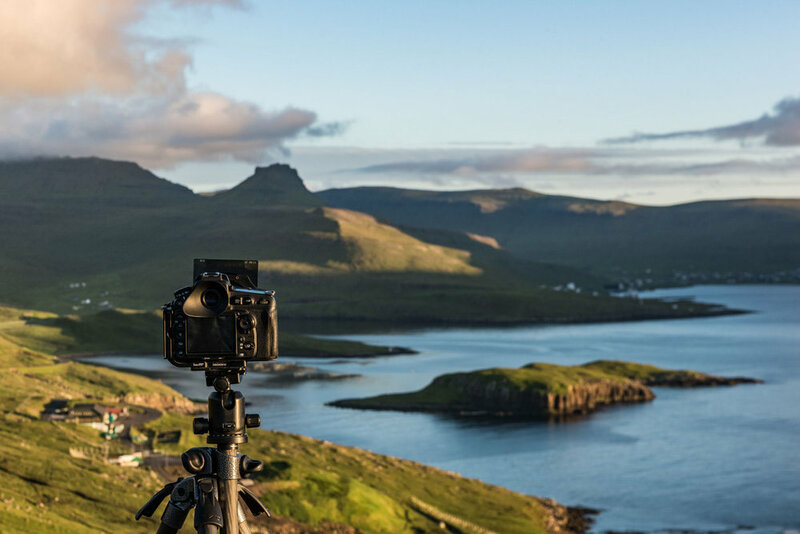 Not only will you be in the good hands of professional photographer James Kelly but you will gain his wealth of local knowledge of the Faroe Islands. Having Spent countless, days, weeks and months at a time in the Faroese landscape each year. James has built up the knowledge of locations less visited by photographers but equally as beautiful as the much photographed beauty spots. During this workshop we will explore the islands of Vagar, Streymoy and Eysturoy, all of these islands offer a unique adventure and beautiful 360° views at every corner and traveling through the tunnels (often under sea) which interconnect these islands. During your trip, we will be breathing in the landscape as much as possible. With james on hand to offer he knowledge and one to one tuition. We will work closely with the landscape, composition and the technical aspects. Bringing out the best of the landscape in your camera. But we must warn you, there will be a lot of walking, rain, wind, sun, little sleep but it will be worth it all. James will review your images as we go along and offer advice (but remember if you love the image, that is all that matters). In our downtime, we will spend getting the most with your post processing, there is the option for image critique and also exploring the local villages. Spaces on our Faroe Islands adventure are limited to a maximum of four. This will allow James to spend time with you to get to know the surroundings and confident in your ability. Our goal is for you to return with not only beautiful images but memories that will last forever and with the passion to return. Below is a the itinerary, which likely change to take advantage of the constant changing weather conditions. The decision about the locations will be made the evening before when the current up-to-date weather forecasts have been announced. Day 2: Sunset will be at Hoyvík, an old part of Tórshavn that has a great view of the sunrise. After breakfast, we will explore the lands surrounding Vestmanna and the dams in the mountains. The sunset will be above the village of Eiði, the perfect location for the sunset. Day 3: To the east of Tórshavn is the area or Argir and a beautiful vantage point for the sunrise. After breakfast, we will drive too Gjogv and Funningur (with dramatic mountain scape) sunset will be in Saksun, a very well know and beautiful location, something out of the lord of the rings. Day 4: You will be given the chance to have a lie in or explore a location from a list. Mid morning we will travel to the island of Vágar and too lake Leitisvatn (known as the lake above the sea), The evening sunset will be from the village of Bøur looking towards the island of Tindhólmur. Day 5: For sunrise we will travel too the peninsular of Strendur. The afternoon, we will revisit Eiði & Funningur. After dinner, we will venture to the island of Kelsoy and photograph the sunset. Day 7: Sunrise will be from a Sornfelli (The mountain with the radar station). After breakfast we will travel and re-explore Saksun and leaving the evening open to travel to a destination of the groups choosing. Day 6: We will catch the early ferry to the island of Suðuroy where we will explore many of the beautiful locations from Sumba to Sandvík. This is my home away from home and a location I know very well. -The trip price is £1600 per person (£165 deposit). Group size is limited to 4 people. - Daily flights from Copenhagen.